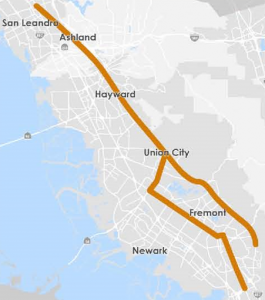 The Alameda County Transportation Commission (Alameda CTC) is launching its public outreach effort for the E. 14th Street Mission Boulevard and Fremont Boulevard Multimodal Corridor project. This is a major commute corridor paralleling Interstate 880 and the Bay Area Rapid Transit alignment from San Leandro to Fremont. Alameda CTC is currently scheduling public events with partner agencies and local community groups along this corridor to receive input on the conceptual improvements developed for this project. For more information on this project, please visit the Alameda CTC project webpage. The first event was held on January 24th at 7:00 p.m. in Fremont, conducted in coordination with the City of Fremont’s outreach for its Mobility Action Plan. This event was in open house format where participants learned and provided input on specific topics of interest. For more information, please visit the meeting information page. Meeting Time: 7:00 p.m. – 8:30 p.m.
Alameda CTC will post announcements on additional public meetings as they are scheduled.